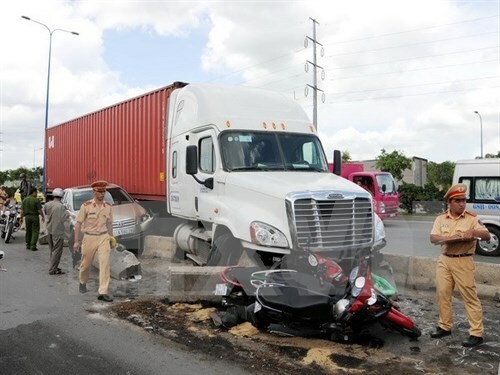 Hanoi (VNA) – As many as 3,465 traffic accidents occurred across the country in the first two months of this year, leaving 1,570 dead and 2,660 injured, an official has said. Khuat Viet Hung, Vice Chairman of the National Committee for Traffic Safety, told on conference reviewing the work on traffic order and safety in Hanoi on March 17 that both the numbers of traffic accidents and casualties decreased from the same period last year. However, Hung warned that there remained an occurrence of serious road and railway accidents, arousing public concerns. In addition, an increasing number of violations regarding overloaded transport were reported in mine-rich provinces such as Yen Bai, Phu Tho, Ha Nam, Ninh Binh, Thanh Hoa and Nghe An and cities with many underway construction projects including Hanoi and Da Nang. Authorities detected and imposed fines on more than 21,800 overloaded transport cases from December 18 to February 18, he added. To reduce the numbers of traffic accidents and casualties by 5-10 percent, Deputy Prime Minister Truong Hoa Binh, who also doubles as Chairman of the National Committee for Traffic Safety, requested ministries, sectors and localities to improve regulations on safety of traffic infrastructure and vehicles, responsibility and ethics of drivers as well as punishments levied on violators.